Heat oven to 350°F. Spray 13x9-inch (3-quart) glass baking dish with cooking spray. In 4-quart saucepan, cook and drain pasta as directed on box. Return to saucepan; set aside. In 2-quart saucepan, melt butter over medium heat. Stir in flour, chili powder, salt, cumin and pepper with whisk until smooth. Gradually stir in broth. Cook and stir until slightly thickened. Stir in 1 1/2 cups of the cheese and the enchilada sauce until cheese is melted. Remove from heat; set aside. Meanwhile, in 10-inch skillet, cook beef and onions over medium-high heat 8 to 10 minutes, stirring occasionally, until thoroughly cooked; drain. Stir in tomatoes. Add beef mixture and cheese mixture to pasta. Pour into baking dish; sprinkle evenly with remaining 1 cup cheese. Bake 15 to 20 minutes or until thoroughly heated and cheese is melted. Any shape pasta would work for this recipe — elbow macaroni or penne would be great! 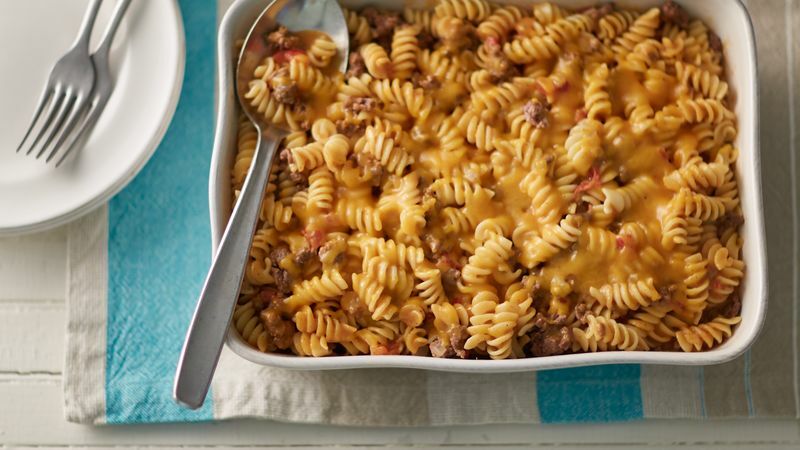 This pasta bake is full of flavor but not spicy — perfect for the family dinner table! For spicier flavor, use the hot diced tomatoes & green chiles.